The Mobile 3rd Generation Intel® Core™ processor family is the next generation of 64-bit, multi-core mobile processors built on 22-nanometer process technology. The processor is designed for a two-chip platform. The two-chip platform consists of a processor and a platform controller hub (PCH) and enables higher performance, ...lower cost, easier validation, and improved x-y footprint. The processor includes integrated display engine, processor graphics, and an integrated memory controller. The processor is designed for mobile platforms. The Mobile 3rd Generation Intel® Core™ processor family offers either 6 or 16 graphic execution units (EUs). The number of EU engines supported may vary between processor SKUs. The processor is offered in a rPGA988B, BGA1224, or BGA1023 package. The datasheet provides DC specifications, pinout and signal definitions, interface functional descriptions, thermal specifications, and additional feature information pertinent to the implementation and operation of the processor on its respective platform. 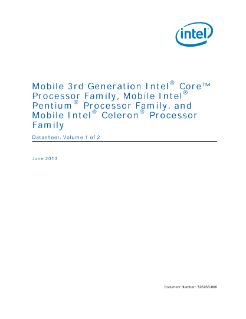 Read the full Mobile 3rd Gen Intel® Core™ Processor Family Datasheet, Vol. 1.